Buy any selected IMANA STOCK CUBES PACK with the competition sticker from selected outlets. Dial *120*3353# as stipulated on the sticker. You will then be prompted to enter the unique code found on the back of the sticker. Once you have entered the unique code, you will be prompted to enter your favourite stock cube flavor or your age or if you are male or female. Entry will be charged at 20c per 20 seconds. Free minutes do not apply. The unique code can only be used once. The competition runs from 22 July to 7 October 2018. 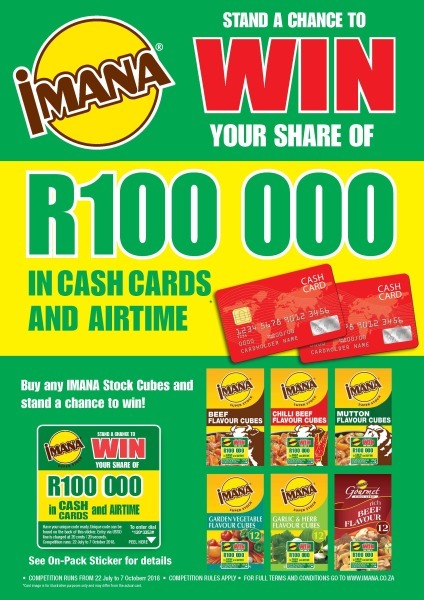 R70 000 in Cash Cards: 10 x R3 000, 10 x R2500, 10 x R1500 cash cards to be won over the competition period.